Please help us evaluate the past year of library services for children! This survey takes approximately 3-5 minutes to complete. We appreciate your help! Plan ahead for February Vacation! Winter vacation…it’s coming and we want you to spend some of it at the library! We’ve put together a schedule of fun and educational activities that will help you beat off the winter blues. 2:00-3:00 PM. Limited to 8 participants. Tuesday, February 17: Family STEM Challenge Night! 5:00-7:00 PM. Ideal for families with children ages 4 and up. Please register in advance, drop-ins welcome. Registration opens January 15! STEM stands for science, engineering, technology, and mathematics. Complete 6 STEM challenges (such as building cup towers and simple Rube Goldberg machines) and be entered into a raffle to win a fabulous prize! More information coming soon! 3:00-4:00 PM. Ideal for ages 2-12. This awesome percussion show features cool instruments and a funny story about Larry the Frog on a quest to find the mythical Marshmallow Island and the legendary dance party that takes place there! Watch the video below for a small taste of what is to come! 10:00 AM – 1:30 PM. For ages 10-12. Limited to 10 participants. Registration required, opens January 15. Learn to make a stop-motion movie using an iPad and your favorite action figures! Here is a stop-motion movie made by kids at the Duxbury Free Library! 11:00-11:30 AM. For toddlers and preschool age children. No registration necessary. February is National Children’s Dental Health month! Miss Mariah will lead a few welcome and wiggle songs then turn the time over to Chestnut Dental Associates. They will read a story all about taking care of your teeth, bring a puppet to show kids how to brush, and bring goodie bags with toothbrushes, floss, and stickers! This is a fun way to help your little ones learn all about taking care of their teeth. 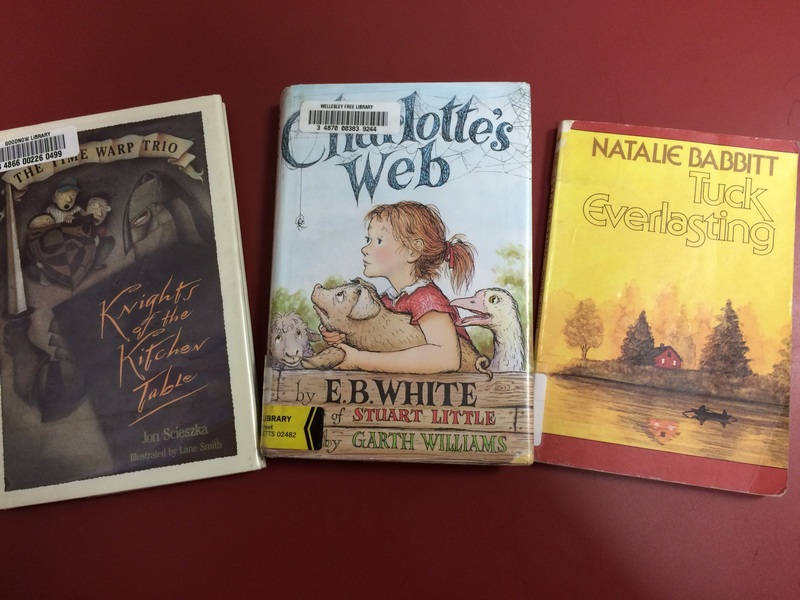 Book Clubs for Elementary Age Students! Why have your child join a book club? Book clubs are a great way to strengthen literacy and language skills. By having others to discuss books with, children will learn to read more closely and to think about books in new ways. They will also learn how to express their own ideas more clearly for others and increase their vocabulary. Book clubs encourage turn-taking, problem-solving, critical thinking, and the love of reading. Besides all that, it’s fun! Visit Medway Library and ask at the circulation desk for a copy of the book. Then, don’t forget to register online! To register visit our Event Calendar and find the event listing on January 21, 2015. Under that listing is a small “Register” button. Click that and fill out a short form. Library Holiday Schedule and New Online Registration! First, please remember that the library will be closed December 24th after 2:00 PM, December 25, after 4:00 PM on December 31st, and on January 1. I also wanted to let you know that starting in January I will be sending out a weekly email with the library events for children happening that week, a new book list, and any other news from the library. Finally, registration for library programs is moving online! You can now register through the library event calendar by clicking “register” on the event and then filling out a simple form. This makes it easier for you to register (do it from home…no phone calls or emails necessary) and makes it easier for me to keep track of who is coming to what events. If you need any help with this process just email me or call the library and we can help. There is one exception to this new system. Paws-to-Read will continue to be a paper registration until we can figure out how to move it online. This fall we introduced a new program called Hands-on Art History for children ages 7-9. At this program we had short lessons on an aspect of art history including movements and specific artists. These lessons used images, picture books, and lots of discussion questions. Then we cemented what we learned with an easy, cool project! If you were unable to come to this program, no worries we are starting it up again in January! However, if you did miss I wanted you to be able to replicate this activity at home and I wanted to credit the cool people whose lesson plans and ideas were incorporated into this program. To that end I have compiled a quick how-to complete with pictures and links to useful resources. So here we go! Not what we made but really close to it! Finally I can actually use one of my own pictures from our program! Abstract Expressionism is exactly what it sounds like…trying to convey thoughts, feelings, and ideas through abstract (not physically concrete) ways. This was a hard one to explain and I relied heavily on this lesson plan. This particular movement grew out of the confusion the world was left in after two world wars and the Great Depression. Life was very confusing and artists were finding new ways to express how they felt about the world. This included Jackson Pollock. I showed how his work begin realistic and steadily became more abstract over time ending on his famous “No. 1, 1950,” also called “Lavender Mist”. Part of Pollock’s technique was connecting to the painting physically on the ground while he painted and using extreme motion to create the painting. That’s why he was called Action Jackson! Whatever bits of dirt or straw or even screws that fell into the painting while he worked stayed there. A picture book that really helped explain his methods is Action Jackson by Jan Greenberg and Sandra Jordan. Registration is required for a 15 minute reading session with our visiting therapy dogs. Sign up at the library. For grades 2 and up. Local author Sue Berard Goldberg presents, “A Pumpkin for Thanksgiving”. Ms. Goldberg will read her story and then lead the participants in a pumpkin themed craft! Books will be available for purchase at the event. Sign up online or at the library. For ages 7-9, limited to 15 participants. 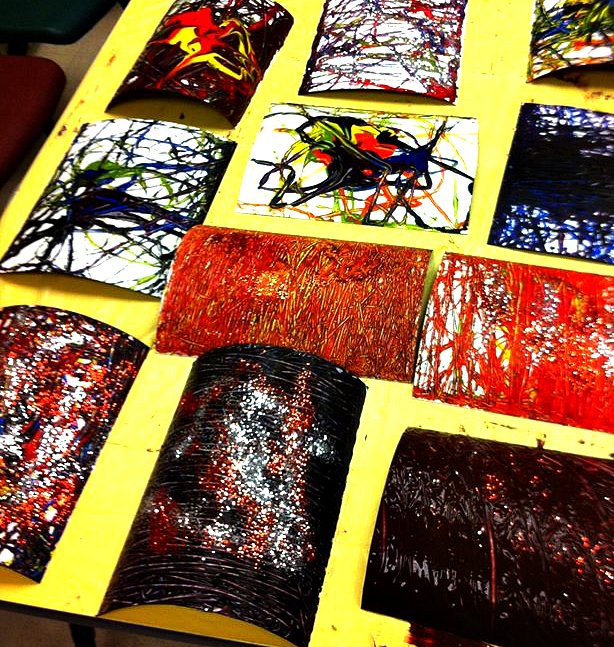 We will learn about abstract expressionism and complete a Jackson Pollock inspired project. Sign up online or at the library. For ages 0-18 months, accompanied by an adult caregiver. Fridays, November 7. 11:00 AM. *Cancelled Friday, November 28. Thank you Inspire Dance Academy for our Toddler Creative Ballet Class! 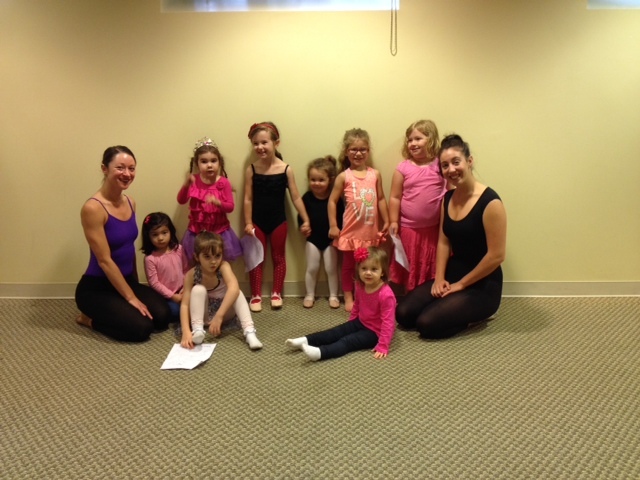 It was such a treat to have Amanda Del Prete of Inspire Dance Academy host a dance class on Saturday, October 4th. Everyone was so well behaved and looked lovely! We were especially happy to partner with a local business to bring this wonderful opportunity to participate in art and exercise to the community. Thank you to everyone who came and hopefully we will see Amanda again in the spring! Follow the library on Facebook!